Slowly, the Lagos vibe is coming to Abuja, and if the population continues to increase the way it is, we may have Lagos-style traffic gridlocks in the city in less than two decades. The signs are already there. Recently, a foreign aid worker who had been working in the North-East of Nigeria visited Abuja for the first time. He was taken aback by his experience in the capital city. He expressed how, for him, it was like visiting a different country. Knowing our country so well, one immediately understands what the foreigner meant. The dichotomy between Nigeria’s urban centres and the rural areas is sharp, and the difference cannot be clearer than in the city centre of Abuja, within the Federal Capital Territory (FCT). Compared to other metropolitan areas of Nigeria like Lagos, Port Harcourt and Kano, Abuja maintains a kind of serenity at its heart that attracts high networth individuals and the assumed middle class Nigerians who can afford to obtain property within the metropolis. Statistics from the United Nations show that the city grew by 139.7 per cent between 2000 and 2010, making it one of the fastest growing cities in the world. With a population currently estimated to be around 2.4 million, available data also shows that more people across all social classes are opting for the relative calm of the city. This influx of people has led to the emergence of satellite towns and shanty communities, such as are seen in Lagos. 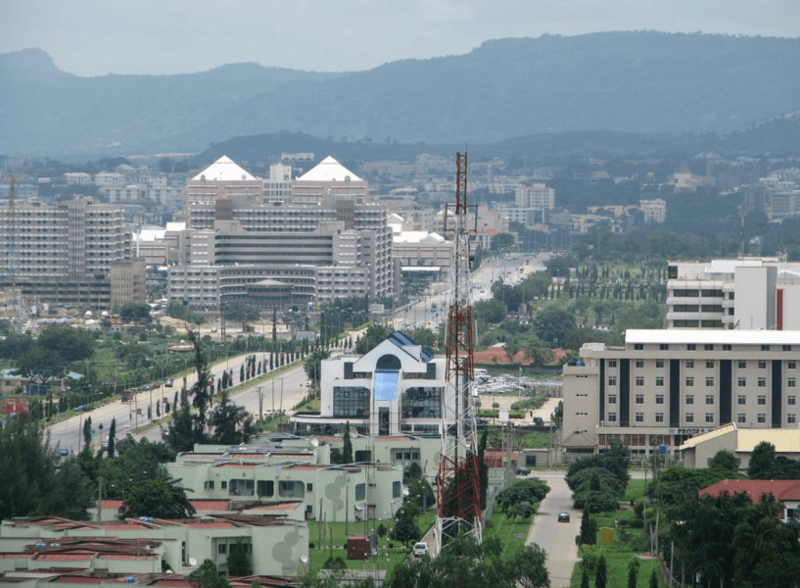 In earlier years, Abuja was thought of as a city for civil servants and top government officials that manage the bureaucracy of the federal government. Even today, ‘Abuja money’ is still synonymous with ‘government money’, but there is a growing variation of commercial activities that accompany the growing population of Abuja. The ‘government money’ in circulation helps sustain a thriving real estate sector and infrastructural development. This in turn enables other associated businesses, like the quarries located in and around the city, to thrive. With thriving commerce, relatively good roads and generally calmer heads, it is not surprising that more people want to relocate to the capital. Focusing on the people, there are the government bigwigs and other heavy weights, who can be found in Asokoro and Maitama, and in some parts of Wuse II and Apo. The mansions erected in these areas, especially in Asokoro, rival the homes of the rich anywhere in the world. Curiously, and maybe unsurprising, many of the seizures of property that have been effected by the anti-graft agencies in their fight against corrupt government officials have been made in these areas. The display of wealth is stupendous, and these regularly empty mansions require a large number of support staff, who are a significant part of the growing population of the city. Sadly, security agents of the state must be counted as part of these “support staff”. The beauty of Abuja is a constant image of what can be, in all 36 states, with the availability of funding and careful management. Even though the capital is not a complete project as yet, it is miles beyond most Nigerian cities and the attempt to close the door of opportunity with high living standards is failing so far, precisely because of that disparity. In many places in the highbrow areas, like Aso Drive, in Asokoro, one cannot just idle around on the street for more than a minute. Before you know it, an assortment of secret service agents and mobile policemen stationed or patrolling the streets will promptly appear to interrogate, with readiness to make an arrest if the response is unconvincing. The tight security is a far cry from that in the outskirts of the city and in other less prestigious areas, where petty crime, abductions and armed robbery are rife. It is a case of the poor robbing the poor, while the money bags sit in comfort and relative safety in their well-guarded mansions. The people considered to be middle class can be found in Wuse, Utako, Garki, Gwarimpa and other parts of Apo. This class of people are either civil servants close to the top or business people who have found a reliable “connection” to the money bags and government functionaries, enough to sustain their family in the pricey capital. They are the proprietors of businesses that cater to the wealthy or contractors that have perfected the fine art of “access”, especially to government projects and clientele. Where they are not civil servants, they are people whose repeated trips from their original locations have realised enough returns to purchase a permanent or second home in Abuja. The satellite towns, like Kubwa in the outskirts of the city, are home to a mixture of these “middle class” Nigerians and others below this class, many of who also come in from as far as neighbouring Kaduna and Nassarawa or outskirts like Gwagwalada, every day. The Mararaba/Nyanya/Karu residents and people from other satellite towns, outskirts and neighbouring states make up over 60 per cent of workers that troop into the city centre every day. The little traffic situations that develop in the city usually occurs during the mass movement from and to these places early in the morning and at close of business. In Mararaba/Nyanya for instance, one may be reminded of the ‘madness’ of Lagos, as the area is densely populated, as one can imagine. Boko Haram’s limited foray into the capital in the past was largely concentrated in just this kind of places, with the considerably lesser security. The true nature of Abuja as “no man’s land” is aptly demonstrated at the close of the year, during the Christmas and New Year preparation and festivities. The city experiences a mass exodus of people who leave the capital to join their families elsewhere in Nigeria. The not so choked streets are near empty during this period, and businesses often feel the strain of reduced patronage during this time. Even the usually busy nightlife at weekends is reduced to a few trickles of people who, for one reason or the other, remain in the capital during this period. In this sense, the allure of Abuja is no match for the pull of family ties and kinship, which the capital city cannot boast of, even amongst Northerners. Many drivers now on the roads of Abuja relocated from places like Lagos, and the Lagos mentality is gradually seeping into Abuja roads. Other people, skilled and unskilled labour alike, are also making the move. Abuja is expanding and word is going round. The growth of the city spells opportunity, and opportunity in Nigeria cannot be reserved for the “privileged”. It is safe to say that the foreign aid worker referred to in the beginning of this piece never ventured outside the city centre, into the shanty towns that dot the capital or the dense outskirts that house over 60 per cent of the workforce. The foreign aid worker also may have not been forced to use the government provided transportation, similar to the BRT buses of Lagos – referred to as “El-Rufai buses” – which are insufficient, and are packed like the famous Molues of Lagos. The private Kabu kabu cars and the associated touts they attract, with their unions and self-designed rules, fill the transportation void in most parts of the city. Slowly, the Lagos vibe is coming to Abuja, and if the population continues to increase the way it is, we may have Lagos-style traffic gridlocks in the city in less than two decades. The signs are already there. Many drivers now on the roads of Abuja relocated from places like Lagos, and the Lagos mentality is gradually seeping into Abuja roads. Other people, skilled and unskilled labour alike, are also making the move. Abuja is expanding and word is going round. The growth of the city spells opportunity, and opportunity in Nigeria cannot be reserved for the “privileged”. David Mark, former senate president, famously made the remark that “Abuja is not for everybody”, in reference to complaints by the mass of low level workers who grumbled about the cost of living in the city. It seems Nigerians disagree with the senator, with the continuing inflow of people into the capital. The surging population may soon begin to tell on the wealthy few, who are still insulated in their ivory towers in Asokoro, except the Federal Capital Territory Administration (FCTA), develops a plan to manage the inevitable population growth. The beauty of Abuja is a constant image of what can be, in all 36 states, with the availability of funding and careful management. Even though the capital is not a complete project as yet, it is miles beyond most Nigerian cities and the attempt to close the door of opportunity with high living standards is failing so far, precisely because of that disparity. All Nigerians want to live a better life, and until the rural communities catch up, the rural to urban migration will continue, especially amongst the teeming youth of this country. For comments, please send SMS (only) to 08058354382.